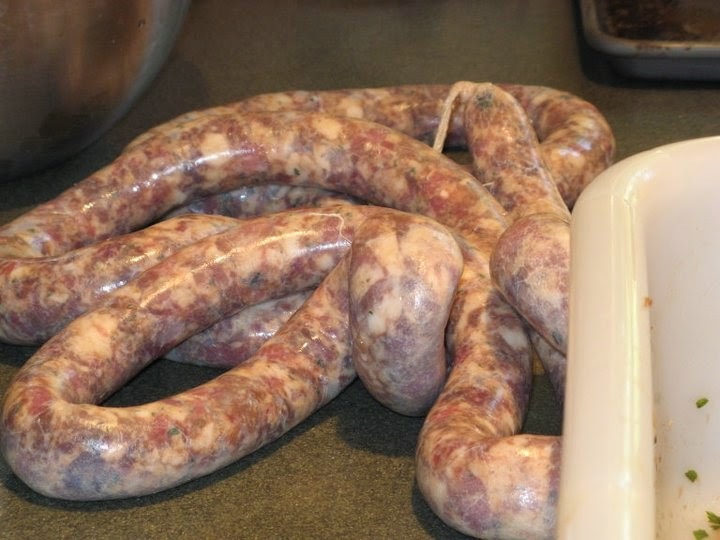 When you make your own sausage at home, you get to control what goes in it. I saw a sausage like this one at Fretta’s Italian Food Specialties in Milford, PA http://www.frettas.com/. For me, Fretta’s is about as close to food heaven as it gets. The first time I drove by, it sucked me in like a magnet, and I was in love with the place! Everything is made with care each day, and made to exceedingly high standards. If you are ever in the Delaware Water Gap area, you want to make sure to get to Fretta’s. 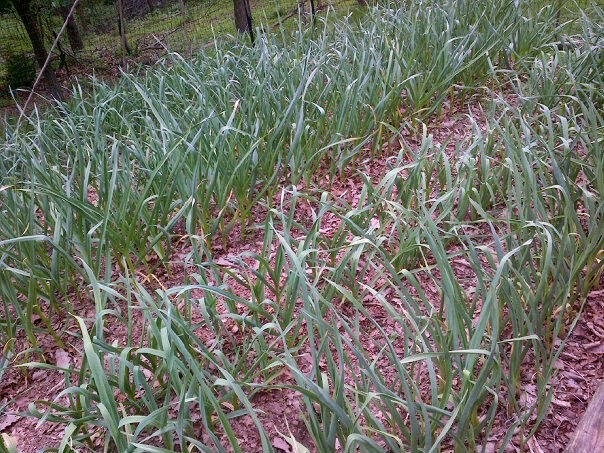 So, one day I was at Fretta’s and we were talking about growing garlic, the right conditions to grow, and the varieties of garlic we like. 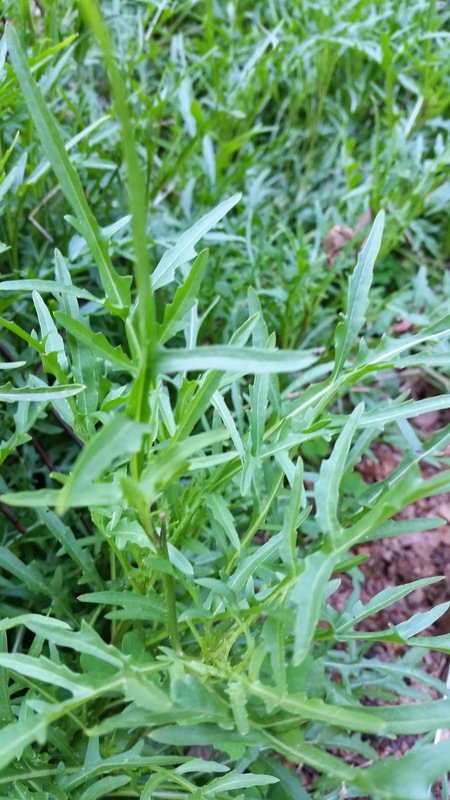 I then shifted to talk about how this certain type of arugula grows like a weed in my garden. It’s the one some folks call “wild” arugula with yellow flowers and deeply spiked leaves. It grows all winter and gets stalks as thick as your finger. The flavor is the best. It turns out that the folks at Fretta’s grow this too, and they turn it into a fresh sausage laden with fresh garlic and a touch of wine. We bought an assortment of Fretta’s fresh links, some of their house made Capicolla, and other goodies for dinner. When I got home to Virginia, I decided that I had to make some arugula sausage. It turned out great, and it is nice to freeze and enjoy some Springtime flavor any time. It’s great grilled to serve with pasta or as a pizza topping. Get the best quality pork you can find for the best flavor. Have meat very cold, with some ice crystals in it. Grind meat and fat through a 3/8 inch grinder plate. Mix in all of the ingredients except the wine. Add the wine and mix thoroughly until mixture is totally uniform. Stuff in casings with sausage stuffer or form into patties. Pan fry patties until caramelized on the outside and just cooked through in the middle. Link sausages can be poached in water and then browned in a frying pan, or slowly roasted on a charcoal grill.